If a commute is too long or too challenging, riders are invited to "rack n’ ride"—load their bikes onto a Connector bus's bicycle rack that day—and ride for free. See information on how to use the front-mount bike racks. Using the bus is a good way to overcome some of the major obstacles to bike commuting in the county. The best way to find out which bus to ride and when is the WMATA Trip Planner. Enter your origin, destination, and time of travel and it will provide info about available public transportation options. The promotion does not apply to Metro buses, only Fairfax Connector buses (Trip Planner includes Connector bus routes and schedules in their application). Streetfilms just posted a new film of cyclists riding during rush hour over the Hawthorne Bridge in Portland. The percentage of people who ride bikes for transportation in Portland is high and growing, leading to more awareness by motorists of cyclists on the road. While the number of cyclists has grown, the crash rate has decreased. On Tuesday morning, April 28, at around 7:30 a.m. a cyclist was hit by a person driving a gray Subaru at the intersection of Park St and Maple Ave (Route 123). This is the intersection next to the small shopping strip that contains Noodles and Co., Chipotle, etc. The cyclist was riding through the crosswalk on the southeast side of Maple Ave (same side as Noodles and Co.), headed southwest away from Tysons. The traffic signal was red for the motorist in the Subaru, who turned right and struck the cyclist. Anyone who has information about this crash please contact us. The cyclist was injured and is asking anyone who witnessed the crash to come forward. This is the second bike crash we've heard about on Maple Ave. in the past two weeks. Another cyclist was injured when colliding with a motorist turning right onto Maple Ave. at Mill St. In both cases cyclists were riding against traffic on a sidewalk. This is the same location where David Marsden was killed in 2005. As Congress works on the reauthorization of the federal transportation funding bill this summer, Streetsblog will feature a series of articles about the process. The first article, What's Wrong With SAFETEA-LU—and Why the Next Bill Must Be Better, is a good description of the current process under SAFETEA-LU. What’s more, SAFETEA-LU made it easy for states to build roads and hard for them to build transit projects. While funds for new roads were simply distributed to states based on a formula, new transit lines had to undergo the rigorous New Starts process — competing with other projects from all over the country — before winning a share of federal dollars. There was no such required audit for road projects. A diverse coalition of groups that see the benefits of transit use and improved bike and pedestrian infrastructure — including public health advocates, developers, senior citizens, real estate agents and chambers of commerce — is demanding a place at the table along with the traditionally more influential highway lobby. Over the next few months, that coalition will be fighting for a federal transportation program that provides a stable source of revenue for a balanced selection of mobility options. On April 19 Daniel Hersh was struck and killed while riding on Shore Drive in Virginia Beach. No charges have been filed against the motorist, who was overtaking the cyclist when he was hit. The crash is still being investigated. As noted by Virginia Bicycling Federation, "Under Virginia law, a driver of an overtaking vehicle must wait until it is safe to pass, then pass with at least 2 feet of clearance. Bicycles are vehicles under Virginia law." More than 100 bicyclists took to the streets Sunday to call attention to bicycle road safety and to memorialize Hersh, 54, who was hit while on one of his regular early Sunday morning rides. On a sunny spring day, the group took to some of the city's biggest, busiest roads - Virginia Beach Boulevard, Independence Boulevard and Shore Drive - to demonstrate that bicyclists ride on the same roads and under the same rules as cars and they expect the same justice, according to ride organizer Wes Cheney. A white "ghost bike" was placed near the site of the crash. Virginia Bicycling Federation has established the Daniel Wayne Hersh Memorial Fund dedicated to bicycling education. 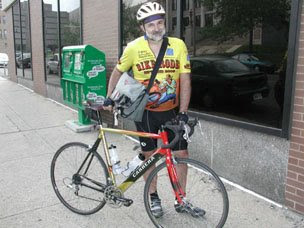 Gregory and Stephen Hersh, the sons of the late Dan Hersh, have designated the Virginia Bicycling Federation as the recipient of memorial donations honoring their late father. VBF will dedicate these funds for bicycling education initiatives within Virginia–targeting motorists, law enforcement personnel, and/or bicyclists–with the goal of decreasing the incidence of future bicycling tragedies within our state. Take a look at the packed calendar of activities in the valley being planned for Bike Month in May. There are cycling/art events, a Clean Commute Day, a Spanish-language cycling clinic, workshops for business people interested in attaining the designation "Bicycle Friendly Business," and discounts at select restaurants for people who show up on bikes. It would be difficult to argue against a project that could reduce crashes by 20 percent, slow traffic, and provide bike lanes. Many bicyclists use this road for commuting and recreation. Participants in the Reston Triathlon often train on this section, which is part of the official triathlon bike course. VDOT has proposed an excellent solution to dangerous conditions on Lawyers Road that should be widely supported by the community. In fact, I would be concerned if VDOT didn't take advantage of this opportunity to improve the safety of the road. Dan Dellinger is a Vienna Town Council member who is running for re-election. At a recent debate he stated that he is opposed to trails between Tysons Corner and Vienna neighborhoods. While people will be able to walk to Metro, "unfortunately what it's going to do is bring the other undesirables into our neighborhood". The above quote is from a video clip from a local news site. Mr Dellinger is featured toward the end of the clip. Most people want to be able to bike and walk to Tysons. Since the only parking available at the four Tysons Metro stations is for bicycles, driving there is not an option. One way to ensure that gridlock in Northern Virginia continues is to propagate the current conditions that prevent people from easily walking and biking between neighborhoods. Why not attend the candidate forum next Wed., April 29, from 7:30-9:00 p.m. at the Vienna Community Center and ask Councilman Dellinger why he's so afraid of people who want to use trails to get around Northern Virginia. You could also ask him how to identify so-called undesirables. How many of the trail users who pass through Vienna every day on the W&OD Trail are undesirables? In his Earth Day post on the Dept. of Transportation blog, Bicycling is an important factor in less carbon-intensive commuting, Secretary LaHood reaffirms his support for bicycling as "an environmentally sound commuting option." The upcoming reauthorization of DOT's surface transportation programs provides an opportunity for us to feature bicycling as part of a new American mobility within livable communities. As I said today in testimony before the House Energy and Commerce Committee, this includes fostering communities where bicyclists feel both safe and welcome on the roadways. Bike-friendly development also has the potential to contribute significantly to the revitalization of downtown districts and offer an alternative to sprawl and automobile-focused commuting. Earth Day is today, but we'll need the sustained engagement of bicycle commuters and their advocates in the weeks and months to come to help keep the wheels of bicycle-friendly legislation on the road. [Emphasis added]. Image of Secretary LaHood at Bike Summit, from Bike Portland. Despite pleas from cyclists, the Fairfax County Board of Supervisors went ahead with the proposed $170,456 cut to the Bicycle Program, a reduction of 45% from their budget. Prior to the final decision, the Board modified the proposed budget cuts but did not restore funding for the bike program. Instead, they decided reject the proposal to add $825,848 to the budget by charging for parking at certain county parks. The final budget was approved by the entire Board. The funds cut from the bicycle program would have gone toward implementing the comprehensive bicycle initiative spearheaded by the former Chairman of the Board, Gerry Connolly. This included "establishing a pilot program for an interconnected bicycling network." This means that at a time when more people are using bicycles for transportation, there will be less money for bike lanes, a bike master plan, bike lockers and racks at transit centers, and a lack of funds for the many other needed bike improvements. According to Department of Transportation staff, "Further field work on the Bicycle Route Map will be eliminated and only one reprinting will be funded, while bicycle lockers and outreach materials/expenses will be minimally funded." At the same time, the Board decided NOT to implement parking fees at certain county parks, as recommended by the County Executive that could have raised over $800,000. We think this is the wrong decision and sends the wrong message to county residents. While we understand that these are very difficult financial times, we think cutting the bicycle program is not appropriate. In a news article entitled Zig-zag lines being painted on purpose WTOP is reporting that VDOT is painting a zig-zag pattern on the road in lanes that approach the W&OD Trail. The Virginia Department of Transportation says it's part of a safety campaign to get drivers to slow down in a high pedestrian and bicycle area. The 500 feet of zig-zagging lines are painted on the ground on Belmont Ridge Road, where it intersects with the Washington and Old Dominion trail in Loudoun County. There are plans to also paint the crooked lines on Sterling Boulevard where it intersects with the W&OD trail. VDOT is to be applauded for using this experimental technique for slowing traffic. It's good to see an approach to safety on the W&OD Trail that isn't aimed solely at getting bicyclists and pedestrians to stop. Motorists need to be ready to stop at these intersections where there is a great deal of ped/bike traffic, and maybe this new treatment will help. As we noted earlier, VDOT recently held a meeting to discuss a proposal to restripe Lawyers Rd from 4 to 3 lanes. A few people who attended the meeting were opposed to the plan. Try to follow the reasoning of one of those opponents. Because there are many blind spots (that will be reduced with the project), and the road is very dangerous (VDOT says that a crash reduction of 20% is possible with the project and traffic will be slowed), VDOT should not implement the project. is concerned that the bike lanes would result in more cyclists and cause further danger. He said cyclists could choose to use the pathways that are located throughout the area. However many cyclists who attended the meeting were in favor of the plan. Others at the meeting thought the plan could make driving on Lawyers Road safer. One homeowner said in the four years she has lived off the road there have been multiple times where she has had to clean accident debris from her back yard. "I know it sounds nutty," said Mary Curtius, a county spokeswoman, but it's part of the eco-friendly county's efforts to lower health-care costs and help the environment. "Instead of jumping in a car and driving across town, people can bike. We're looking for every way we can think of to work on prevention and wellness." Actually, it doesn't sound nutty to me, or to the millions of people around the world who use bikes for basic transportation. Why the county spokeswoman thinks it's nutty is surprising. The Fairfax County bike coordinator tried to implement a similar bike sharing system at the county government center only to be told that there were too many liability issues. If Arlington has found a way to do it, so should we. The classic Dutch bicycle is featured in an article in the New York Times, Riding the It Factor. As bicycling becomes more popular in New York City and elsewhere, more people are using bicycles for transportation, without the need for special bike clothes. In the Netherlands, bikes are a regular transportation option for people, most of whom ride simple, upright bikes with fenders and chain guards that protect their clothes. The Great Downturn may have its first real status symbol. It has plenty in common with recent extravagances. Like the Range Rover or the Sub-Zero fridge, it has a solid frame designed for function. Like a Louis Vuitton trunk, it has a chic design and a patina of history stretching back to the 19th century. And like a bottle of San Pellegrino, it evokes that genteel way of life that Europeans are always going on about. This new It object is the glossy black Dutch bicycle, its design unchanged since World War II. The second article, Biking Has Its (Tax) Benefits. Or Does It?, describes some of the problems with the Bicycle Commuter Tax Benefit. The main problem is that cyclists are not able to combine the public transit benefit with the bike benefit ($20/month), so most choose the transit benefit. In a place like New York City many cyclists combine public transportation with their bike commute. As we noted in an earlier post, Congressman Blumenauer's Multi-Modal Commuter Transit Bill will allow cyclists to use both benefits when applicable. As we mentioned earlier, Accor services "began offering a bicycle commuter check to employers only last month", although only to companies with fewer than 50 employees. Next week, on Earth Day, the company plans to announce that it will be setting up its Commuter Check program for participating medium sized companies — those with as many as 5,000 employees. Two bike lane-related meetings were held this week. VDOT will be repaving Gallows Road from the Dunn Loring Metro station north to Old Courthouse Road in Tysons. Fairfax County has requested that bike lanes be added when the road is restriped. Money has been available for many years. The Gallows Road meeting on Tuesday was a chance for the community to hear about the proposal, see the plans, and comment on the project. About 25 people attended the meeting hosted by Supervisor Smyth, who introduced the VDOT and Fairfax County DOT team who presented the plans. The first phase of the project will consist of bike lanes from just north of the I-66 bridge to Idylwood Drive. There will be a short section of wide curb lanes between the W&OD Trail and Idylwood. Construction is expected to occur this summer. The second phase will include bike lanes and wide curb lanes from Idylwood to Old Courthouse. This phase involves more extensive median and pavement work and will not happen until 2010. VDOT presented details of the project at an earlier FABB meeting. Several bicyclists spoke out in favor of the project. FABB supports the project and sent a letter of support to VDOT earlier in the year. A representative from an adjacent homeowners association submitted a list of comments. Most comments were positive and we look forward to the completion of the first phase later this year. The Lawyers Road bike lane meeting was more contentious. VDOT proposes to reduce the travel lanes from 4 to 3 lanes with 5-foot bike lanes and a center turn lane between Fox Mill Rd and Myrtle Lane, about 2 miles in length. See notes from the first Lawyers Road meeting. While the majority of attendees supported the project, a few people were strongly opposed. One person started off on the wrong foot by joking about getting points for hitting a cyclist; sorry, that's not a laughing matter. Most of the concerns were based on a belief that a road can't be reduced from 4 to 2 travel lanes and still function properly. Randy Dittberner of VDOT was very good about explaining the benefits, related to slower speeds and fewer crashes. It's hard to argue against a road plan that will potentially reduce crashes by 20% and have almost no reduction in travel times. And by the way, will create the first ever bike lanes in Reston. This could be one of the first road diets in Northern Virginia and could be looked upon in the future as a starting point for many more to come if it works. Road diets are not uncommon. According to the Wikipedia entry on road diets, "There are perhaps over 20,000 road diets in the United States, with another 500-1,000 being conducted each year." Dan Burden, a nationally known ped/bike advocate, has written a good article on road diets. If you haven't written to Mr. Dittberner or Supervisor Hudgins about the project, please do. Just a few words of support helps. Many cyclists use the route for commuting to work or to reach the nearby Fox Mill Shopping Center and the new paved trail on Reston Parkway. Many participants in the Reston Triathlon train on this section which is part of the official triathlon bike course. The Reston Bike Club uses this section as well. It's time for a dedicated bike facility for cyclists in Reston. Bike advocates in Oregon are working for passage of an Idaho Stop law. It's called the Idaho Stop law because "in 1982, the Idaho legislature passed a law that allowed bicyclists to treat stop signs as yield and not always come to a complete stop" (from the BikePortland Idaho Stop Law FAQ). Most cyclists don't come to a full stop at stop signs; they slow, check for oncoming traffic, then proceed cautiously. Some cyclists proceed not so cautiously, as do many motorists. The FAQ does a good job of explaining the nuances of the proposed law, but the video below does a much better job of visualizing how the law would work and why cyclists prefer to maintain some forward momentum at a stop sign. We were asked recently to give a presentation on Bicycle and Pedestrian Access in Transit-Oriented Developments (pdf) at a TOD seminar sponsored by local transit groups. The seminar was held today at the Oracle offices in Reston. It was a good opportunity to discuss the importance of bicycling, especially as a way to access transit. Most discussions of bicycle and pedestrian access in TODs tend to lump the two modes together, even though they are very different, especially in more dense urban areas. In urban areas there needs to be separation between bicyclists and pedestrians, and in most cases bicyclists are safer on the road, either using bike lanes or wide curb lanes, or riding in normal traffic lanes. Cyclists can cover much more distance than pedestrians, and bike connections leading from residential areas to transit areas are especially important. It is estimated that 40% of ALL trips are 2 miles or less, and for these short trips, bike travel time is comparable to drive time, and it's more predictable. That a Tysons Metrorail Access Group (TMAG), similar in composition and purpose as the RMAG group, be established with the representatives from three bordering Supervisor districts, TYTRAN, and the Town of Vienna, to create a plan that identifies multimodal access challenges and possibilities to Tysons four new Metrorail Stations. Direction to staff to report with necessary funding and the proposed structure. With the Tysons Plan nearing completion, bus access, sidewalk and trail, and bicycle connectivity to and from surrounding communities will be vital to the success of the new urban "downtown". See the March 30, 2009 Board Summary, Item 50, and the Tysons Task Force website. The WABA Annual Membership Meeting was held last week at the Arlington Central Library. FABB members Douglas Stewart and Hunter McCleary were honored for their service on the WABA Board. Douglas is the outgoing President. Thanks to both Douglas and Hunter for your service to the bicycle community. I've been elected to serve on the current WABA Board. My main area of interest is advocacy. I want to help strengthen WABA's advocacy role in the region. Several awards were handed out at the meeting: Jon Morrison of Montgomery County, Phoenix Bikes, Casey Trees, and Greater Greater Washington (I hope that is everyone; I couldn't find a list and my notes are incomplete). Eric Gilliland (who would leave the next day to spend a week meeting with bike advocates in Helsinki, Finland) gave a summary of WABA's recent accomplishments. He also mentioned that indications are that the Metropolitan Police Department would not file charges against the driver of the truck that killed Alice Swanson last year. We have not been able to find out more details. As a warning to us all, as we were leaving the meeting it was announced that an attendee's bike was stolen after being left unlocked for a brief period outside the library. There's a reward for the stolen bike. We just returned from a brief trip to Atlantic Beach, one of several small beach communities east of Jacksonville that includes Neptune Beach and Jacksonville Beach. It's a good place for bicycling with a street grid composed of low-speed residential streets and a long commercial strip parallel to the beach with bike lanes. Bicycles are everywhere, mostly single-speed beach cruisers, almost all of which are crank forward bikes that are low to the ground with the pedals further forward than a conventional bike. People are not in a hurry and they cruise through town on their bikes. They avoid parking hassles and they get some exercise and can enjoy the mild climate. Most of the local and through traffic follows route A1A. Parallel to A1A and closer to the beach is 1st Avenue. Formerly it was a congested street with tourists and locals cruising in their cars. To calm the traffic, stop signs were placed on almost all of the cross streets and bike lanes were installed. Some streets are blocked to through traffic with entrances for bikes. This results in very slow speed and low volume traffic. Bicyclists generally ride slowly through stop signs, and motorists accept that reality. Motorists yield to all bicycle traffic. Speeds are so slow that it works; the occasional tourist that doesn't understand this practice gradually comes to accept it. The community doesn't need to implement an Idaho stop law, it's the norm. When we design our streets for people, people use them. As the weather warms, area trails are becoming increasingly more crowded. Last weekend traffic on the W&OD Trail was nearly stop and go in several locations. What is normally a relatively wide trail was packed with walkers, runners, rollerbladers, and all manner of bicyclists, including fast road bikes. With very few bike facilities on our roads, most cyclists end up on the trails. There are more people on bicycles in this city than there have ever been before. This visibility and accompanying attention presents challenges and also gives us an opportunity. So, it is in that light that I make a request of regular cyclists: be exemplary. What does it mean to be exemplary? To me it means the two "C's" of cycling: Courtesy and confidence. I believe courtesy also dictates passing at appropriate speeds. When it's crowded, this could mean at little more than a walking pace. When passing another person on a bike, always pass on the left. In my experience, people walking also appreciate hearing a discernible audible warning. That generally means more than a mumbled "on your left." A bell is best. Metropolitan Washington Council of Governments recently released the results of a survey of 11,000 households (pdf) in the Washington metro region to gather updated information on area-wide travel patterns. As the Commuter Page Blog pointed out, the percentage of people who walked or bike doubled in both Arlington County (3.8% to 7.6%) and the City of Alexandria (4.5% to 9.0%). There was no change in Fairfax County (1.7%). In both Arlington and Alexandria the percentage of people driving decreased while in Fairfax it increased from 77% to 79%. What do Arlington and Alexandria have in common? They are relatively densely populated areas with a dense street network, often consisting of a grid of streets. Both jurisdictions have invested heavily in creating bicycle- and pedestrian-friendly communities. Fairfax County on the other hand has a different street network. As we noted earlier, Fairfax is cul-de-sac heaven, with few connecting streets and a population that is relatively spread out. Even so, from my observations, many more people are commuting by bike in Fairfax than in the past, and many more want to do so. The survey was conducted between January 2007 and March 2008, just before the price of gas spiked to nearly $4/gallon. From March to October, when the price of gas dropped to below $3/gallon, many people started using bikes for transportation. With very few bike facilities available in Fairfax, it shouldn't be any surprise that few people travel by bike. If given a choice, we think many more people would use bikes for transportation. Now is the time to provide that choice.